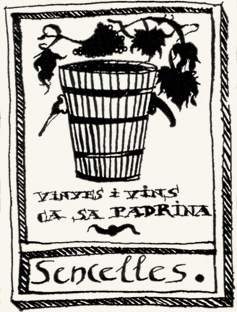 Andreu Suñer is the owner of the small winery “Vinyes I Vins Ca sa Padrina”, located in Sencelles. He welcomed us and took us on a long walk around his vineyards. We finished this interview in the industrial premises of his winery. How did your interest in wines start? In 1999 I enrolled on a course organised by “Fundació Universitat-Empresa”, which consisted of a sort of introduction to viticulture and enology. I liked it so much that just after finishing it, a colleague in the course and I decided to set up our own winery. In 2009 we bought his share in the company so it’s now entirely owned by my family . But didn’t you have a family tradition in wine production? That’s right, My family from “Can Tano” in Sencelles had always produced wine for personal use and a little more. However, the business we set up was to engage ourselves in viticulture more professionally and using more modern techniques. We must keep in mind that the old concept of making wine isn’t compatible with our time any more. The systems used by our grandparents are of no use today, because what’s most important nowadays is to keep strict control over fermentation, which was impossible then due to lack of appropriate technology. However, it is a small business, isn’t it? Of course it is! When they ask me if I have a winery I always say it’s actually a “shed”, because it’s a small family business with only two employees on 10 hectares in Sencelles. Depending on the harvest, we usually produce between 20.000 and 25.000 bottles of red wine, some 7000 of white wine, which have always been sold out in the last few years; and some of Rosé wine. This year we dared to commercialize it and the 1000 bottles we launched were sold out weeks ago. We are so small that the sommelier of the old restaurant “El Bulli”, Ferran Centelles, recommended our wine and the sales soared!. In fact, our white wine stocks ran out. In his wine club, called “Wineisocial.com” he dedicated a few lines to us, emphasizing the authenticity of our wine, its indigenous character, its strong personality, which have been a bonus for us. This praise, coming from a professional of such prestige, is a great recognition of our work. What kind of wines does your winery produce? We started in the year 2000 with a red wine called now MONTENEGRO, which is 60% Mantonegro, 20% Merlot, 15% Cabernet Sauvignon and the rest is Shyraz and Callet. By the way, the 2012 Montenegro is exceptional! In 2010 we brought out our first white wine, called MOLLET, which is made with the varieties of Premsal Blanc and Chardonnay. We have launched our first Rosé with the 2012 harvest, which we have called ROSAT de Ca sa Padrina and has sold very well, it is basically made with Merlot and Mantonegro. All these wines are produced under the rules of the Designation of Origin Binissalem-Mallorca (denominación de origen). A guarantee of high quality wine, thus, the consumers know what they are buying, since an official institution is in charge of the surveillance and production control. Half of the wines are sold in Majorca, a 20% of them is sold in the rest of Spain and the remaining 30% is exported to Germany, Japan, Korea, the USA, etc… We have recently made some commercial contacts with Canada and Russia. I feel so proud when I see the parcels ready to be sent to Korea with their tags in Korean! I ‘d never have thought that such a small winery would be appreciated so far away. I’d like to launch a sweet wine. I’ve been experimenting with a combination of varieties but I still haven’t reached my goal. I hope the tests come out well so that we can soon commercialize it. If I don’t like a wine I won’t put it on sale…Finding the exact turn in our Rosé took me three years of hard work but it’s been worthwhile since it has sold very well and become very popular. We hope to be as lucky with the sweet wine!